So, you have pocket gophers? Or rather, they have invaded your space? Many people have tried many ways to get rid of gophers; water flooding, gas fumigation, poisons, traps, to name a few techniques that have been employed. There are tools created to poke into burrows and drop poison pellets into the burrow; traps placed in gopher holes (after finding an active hole) has been another way to eliminate the gopher from gardens and lawns. I have monitored gopher activity on my property for several years, and I'd like to explain a technique that I use, and why I think it is effective. First, I use a poison. It probably doesn't matter which poison, as long as it is a single-dose rodenticide. (See http://npic.orst.edu/factsheets/rodenticides.htmll to learn the meaning of a 'single-dose rodenticide' and to learn about rodenticides. Become familiar with cautions concerning their use and potential harm to pets, children, and birds.) My 1st choice is '4 Lbs. Cooke Quick Action Gopher Mix' but this seems to no longer be available. My local hardware store tells me the product was 'discontinued', but for whatever reason it seems not to be available, the active ingredient is (was) strychnine .5% (99.5% inert ingredients). It looked like green grains of grass, and however it worked, it worked; absolutely, 100%, every time. If it was discontinued, my guess (and only a guess) is that it was too hard to control distribution. After all, it is highly dangerous as a poison to mammals, and people are mammals, so - safer not to sell in the absence of any distribution control. But this is a guess – and a weak cry to make the product available again! But what I want to share is not the use of a specific poison, but a time proven technique that should (will) work with any single dose rodenticide. There are some characteristics of this method that I need to mention. First, there has to be a mound indicating the gopher's presence. The mound is dome shaped, and can be a few inches across or a foot or more. The mound is the result of burrowing activity, and as the gopher progresses down his tunnel he hauls the dirt back to the entrance and piles it up. Thus the first step in this attack is to identify an active mound. (If infested your garden is infested, you may see many mounds.) To identify an active mound, level all of the mounds with your hand, the back of a rake, a stick... whatever it takes to reduce the mound to bare dirt level. Wait a day - any mound then becomes obviously active. 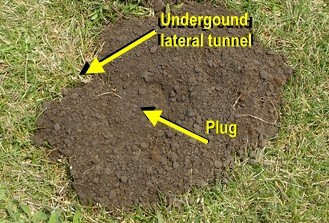 Second, locate the hole representing the burrow entrance under the mound. Yes, you will have to get on your hands and knees. This is tricky because gophers have learned over the last millennium or two just how to hide themselves from predators. You have the advantage of knowing that if dirt is being heaped up, the burrow (a hole to that tunnel) MUST be present! Poke gently until you find it. This may take some time and patience, but take the time, be patient, and as you learn how the creatures construct their burrows you will find that once you've prodded and discovered the opening, the burrow will travel diagonally down and away from the mound. Carefully expose the hole without tearing up the area around the mound. Simply locate the hole with your fingers and enlarge that opening ever so slightly so you can peer diagonally into it. So far, so good. You've located an active mound, and you've opened the hole for inspection. You have moved from being frustrated about gopher presence to being able to do something about it. Now, let me say a few words about gophers and the way they work. They are industrious in digging their way through your soil, looking for the underside of your grasses, small tree roots, bulbs, and whatever goodies they can find. They are also a mammal, which means they have eyes, a nose, and lungs. They create breathing holes for their burrow, and you may have seen a perfectly round hole seemingly doing nothing, hidden by grass or brush and with no mound nearby. It is important that you do NOT use this breathing hole to place your poison. You are looking for the activity center, the active mound, because when you place the poison in the opening you're created, you want to see proof that you've done what you set out to do: kill the gophers who have invaded your property. This is the trick: deliver a tablespoon (that's enough) of your chosen single-dose rodenticide into that hole. I use a long handled teaspoon and drop two level teaspoonful into the hole as far down as I can, hopefully out of sight. LEAVE THE HOLE UNDISTURBED after delivering the poison. You want to see proof that the poison has worked, and because the gopher is industrious he will find the damage to his hole, eat the bait, then repair the hole. THIS IS HOW YOU KNOW THE METHOD WORKS. Come back the next day, giving the rodent time to find, and repair, the damage. When you see that the hole has been repaired, level all of the mound with your hand, the back of a rake, a stick... whatever it takes to reduce the mound to bare dirt level. Wait a day - there should be no further mound activity. I do not believe you will see any gopher activity within the radius of 30 feet, the average size of a gopher community. If your garden area is spread out over more than 30 feet, you probably have several families of gophers consuming plants and goodies you are providing. Repeat the procedure outlined above for each family area. There is no need to bait more than one hole (mound/burrow) within 30 feet, since within this radius there may be several mounds but all will be the result of one family and you'll only need to bait one hole to achieve results. Additional holes may not be 'repaired' if the activity is the result of the same family. Not only might you think this hasn't worked (even though no new mound appears), but you create the risk of poisoning a pet or causing unnecessary risk by baiting more than one hole in a 30 foot radius. Remember the breathing hole? If you pour bait into the hole you’ll have no way of knowing the effect of your treatment; see also the comment above about not needing to bait more than one hole. The gopher may or may not take the bait when poured down the breathing hole, but why try it? Good luck, and please let me know of your success. Especially let me know if you have a better way; I am always anxious to find a better way.